which stood for Dora Tate, but also, I later learned, for Don’t Touch. Years earlier, when Lucy first started staying with us whenever her mom traveled, she had caught me snooping around in it. I found a pretty photograph of my Aunt Dora with her hair pinned up, smiling, wearing bright lipstick. There was a flattened corsage with a white ribbon, a jade ring, a bracelet, and a comb with a carved silver handle. I was reaching deep into the box for other things when Lucy rushed at me and clamped the lid down hard on my fingers. The sharp prong of the gold lock dug deep into my knuckle. When I opened my mouth to scream, Lucy covered it fast with her free hand. I nodded in assent, knowing I would agree to pretty much anything to get that latch out of my finger. She lifted the pressure and I pulled my knuckle off the little hook. It was already swelling and tears sprouted from my eyes. Lucy went to the bathroom for mercurochrome and a Band-Aid. When she saw that blood had dribbled on my jeans, she ordered me to go wash them. My cousin was only two years older than I but she was bossy. She said all New Yorkers were. Hoping to avoid jail, I told my mother that a kid in P.E. stepped on my hand, but after she looked at my gouged finger, I had to lie more and add that a metal thing was stuck in his shoe. Then she hustled me to the doctor for a tetanus shot, and I had to lie to him too. Lucy just laughed at me afterward and said now I’d have to marry for money, marry someone who could buy me a rock big enough to cover up the nasty scar on my ring finger. I was not happy to see my cousin stroll back into my room and plop down on my bed. “So where is Aunt Dora traveling this time?” I asked. It was a simple costume compared to mine, which had a belted gown with a black-and-gold Egyptian headdress, a pale-blue train, a long staff, heeled sandals, and lots of thick arm bangles: I was going as Cleopatra. I even had a rubber snake to show how she died, as well as make the costume creepier. My mom said the costume showed off my best feature: my long, dark hair, which I washed nightly to keep it shiny. My mom combed a special hair oil through it before bed. My blue eyes came from her, but my hair came from my dad, who grew up in Chile. Lucy didn’t have a dad, or at least not one she knew. On Halloween night I made fishtails at the edges of my eyes with a black khol pencil and swished around in my blue see-through train. Lucy smirked at me. She probably didn’t think I looked Egyptian, but to me the real joke was her being a nurse. My mother strung up rubber bats and giant spiders and opened the front door for us. “I can light the way for the queen with my candle,” said Lucy, being a kiss-up. My mother patted her nurse cap affectionately and dropped an extra Snickers bar into her plastic pumpkin. She was way too nice to my cousin. If she knew the true Lucy, I was sure she wouldn’t be allowed to stay with us. We ran through the neighborhood to the best block for candy, where the houses were decorated with shrunken heads and skeletons, bloody ghosts and vultures, and lots of blinking orange lights. Everything was great except for the long lines we had to wait in for the candy. Weirdly, Lucy kept telling me to go first. I thought this uncharacteristic and I wondered what she was up to until I felt the heat against my back and smelled my hair being singed. There was smoke too. I knew exactly what was happening. I dropped and rolled on the wet lawn next to me, ruining my beautiful costume as I flailed around like a crazed pig in mud, desperate to squelch the flames. The next day, at the hair salon, my mother cupped my shoulders sympathetically as the stylist snipped away at my head. “You were lucky that your skin didn’t get burned. It’s a miracle that only your hair caught fire.” My mother put on a brave face but I did not. I was furious as I watched ten inches of my ravaged hair drop to the floor. Lucy said I looked cute in a pixie but I knew I didn’t. Her mother probably never took her with her to Paris or Japan or India or anywhere else because she was just too horrible. A year later, when my mother got sick and needed chemotherapy and radiation, she sent me to her sister’s in New York for three weeks—Lucy’s house. I packed for the trip begrudgingly, filled mostly with fear but also with some curiosity. I had last met my aunt when I was a toddler, but I had heard a lot about her Manhattan lifestyle over the years from Lucy—the dressy parties, the shows they went to, the luxurious Madison Avenue boutiques they shopped in. Lucy bragged about her upscale bedroom—its marble fireplace, the bathtub with jets. They had a cook and two Malteses that she didn’t even have to walk. She attended an exclusive private school with movie stars’ kids as classmates. I figured I’d enjoy a little pampering myself in New York. When the taxi driver pulled up in front of a dingy building on a treeless Brooklyn street, I knew there was some mistake but knocked at the basement apartment anyway. Aunt Dora answered the door in sweats and a floppy sweater. “How is my sister?” she asked, helping me out of my coat. I thought my mother looked lots better than my aunt, even though Aunt Dora was five years younger. Aunt Dora looked too thin; her skin was sallow and her hands shook as she spread my coat on a hanger. I didn’t dare let her carry my suitcase; the weight of it might tip her over. Lucy’s room had a musty green carpet and a single window that looked at the brick wall on the building next door. 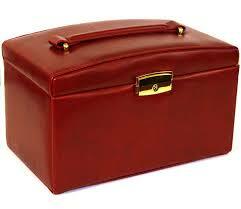 The red jewelry box sat on her bureau. I put my suitcase down next to the cot set up by her bed and felt awkward. I wasn’t sure what to talk about with my aunt. “How was Paris?” I asked. Lucy came up behind her mother. “She doesn’t keep one,” Lucy said, squinting at me. She took her mother by the arm. Aunt Dora shuffled down the hall. “I’ve never been to any of those places,” she said dreamily, “but someday I’d like to travel.” She shut her bedroom door with a click. I glared at Lucy but she had already turned her back. She stirred soup in the cramped kitchen and then poured some in a bowl for me before putting the other bowl on a tray. Then she uncapped all the bottles. I had never seen so many pills—long capsules, small tablets, colored ones, speckled ones. Lucy counted them out carefully, slipped them into a slotted plastic box, and then put it on the tray with a glass of water. Lucy carried the tray down the hall. I didn’t ask any more questions that night, but the next day, when Aunt Dora was still asleep and Lucy had gone to the grocery store, I peeked again inside the red box on her bureau. There was the same jewelry and trinkets and old photographs of good times in her mother’s life. There were also some forms with Aunt Dora’s name on them, checking in and out of someplace called McLean’s. Apparently she had at least travelled to Boston. I didn’t get pampered those three weeks at Lucy’s, nor did I go to the Statue of Liberty or Bloomingdale’s or any Broadway shows. But my cousin did teach me how to cook, something my mother appreciated when I got home. Many years later, after both our mothers had passed away and we had exchanged semi-regular Christmas cards, I was invited to Lucy’s wedding. I didn’t know much about her life except that she was working as a travel agent in Seattle and taught yoga on the side, but I knew she didn’t have much family and decided at the last minute to go. She greeted me with a wide smile, looking healthy and calm and proud of her pretty studio with views of Puget Sound. She chatted excitedly about the wedding details, the Mazatlan honeymoon, the man she thought she’d never find. I was struck by her deliberate way of focusing the conversation on the present and the near future, never drifting to our shared past. Her bookshelves were covered with boxes she had collected on her travels: an Asian one painted with delicate white egrets, an intricately carved Indian box with inlaid enamel, a glittery one with a miniature Eiffel Tower on it. Lucy described each city she found them in. “Where’s your D.T. box?” I eventually asked. “What?” Lucy’s eyes widened, eyes clear and hopeful. She shifted her gaze out the window. “I don’t remember it,” she said, staring at the still, glassy Sound. I looked down at my knuckle, where my slim wedding band never came close to covering up the mark she had made. I considered wrapping my hand into a fist and thrusting it under her nose. But I didn’t. She craned so earnestly toward the shining horizon, her unblemished finger bright with a teardrop diamond. My own scar had faded long ago; maybe now hers would too.